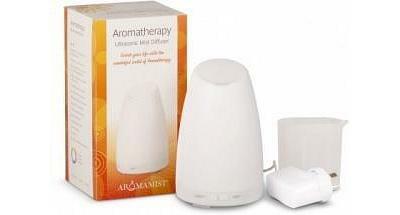 Diffuses essential oils for aromatherapy applications Safe, heat-free ultrasonic operation produces cool mist vapour Serene LED lighting effects Convenient, safe ultrasonic diffusion lets you use essential oils for aromatherapy (or just for their pleasant natural fragrances) with less mess and less worry. 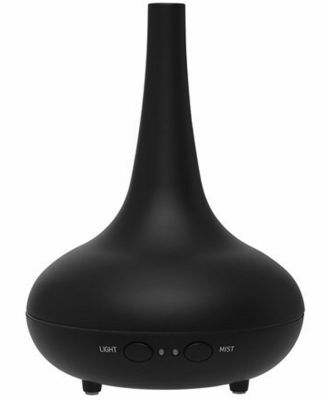 Instead of volatizing oils with heat, the technology uses ultrasonic vibration to produce a fine, cool mist that easily disperses essential oil molecules into the air. There’s no open flame, and no oily hot water to clean up later. Essential oils also retain more of their natural therapeutic properties when they’re not exposed to intense heat. After you add a few drops of essential oil(s) to up to 100 mL of water in the reservoir, the Serene Mist Diffuser will operate for about four hours on continuous mode (as much as eight hours on intermittent mode), then shut off automatically when it’s empty. Meanwhile, LED lights display cool, calming colours to enhance the serene mood. The lights can be set to multi or single LED mode and are activated independently, so you can use them even when you’re not diffusing oil.